A fast absorbing intensive eye treatment that helps repair the advanced signs of ageing that appear around the delicate eye area, making us look older than we are. 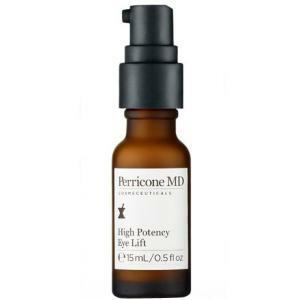 High Potency Eye Lift actually lifts skin for a visibly transformed appearance while minimising deep lines, wrinkles and bags under eyes with Dr. Perricone's patented anti-ageing ingredients: DMAE and Phospholipids. Also formulated with Pycnogenol to address loss of elasticity and help brighten skin's appearance. Paraben-free. Helps repair the advanced signs of ageing that appear around the delicate eye area. Lifts skin for a visibly transformed appearance. Minimises deep lines, wrinkles and loss of elasticity. Dr. Nicholas Perricone is a board-certified dermatologist, world-renowned anti ageing expert, award-winning inventor, educator and philanthropist. He has developed a range of cosmeceuticals and nutritional supplements that effectively help to improve the health of the skin, reduce wrinkles and heal sun damage, leaving you with a smooth and radiant complexion. If you want results, I couldn't recommend this enough. My eyes look so much more refreshed. Seriously, I can't tell you how much a difference it has made to the appearance of my eyes. I have suffered with dark eyes/hollows for years now and had tried the majority of run of the mill brands to no affect. I stumbled on the Mankind website more by chance and then took a punt at this based on the previous review which is spot on. It really does lift your eyes and also the darkness too. Yes, it is expensive, but if you want results then I'd give it a try, I can't tell you how much more confident I feel. Its not often one can see visible positive results after one application of product. However after using High Potency Eye Lift on just one occasion I was able to see an immediate difference. Although my skin is in good condition I had noticed increased lines around my eyes in recent months, at 53 years old this is not surprising. Hence my purchase of this product. The lines were less visible, the area of skin around the eye was light and smooth. I am indeed looking forward to further improvement after a sustained period of use. Expensive; yes, but well worth it.